Imran Khan Dips Donut and Pizza In Chai. Big Deal ! Breaking news! Imran Khan was found dipping donuts and pizza in chai!!! Horrors of horrors! Things would come to such extreme that PTI’s chairman would be caught guilty of dipping pizza in tea who would have thought? But such is our politics and politicians. They become unpredictable by the day, causing heart break and riots among the public. The video that has gone viral as soon as it got shared on social media has created a frenzy among his admirers and haters. People were seen typing furiously into their phones and laptops in reaction to this unexpected turn of events in the PTI circle so close to the elections. If you found the above news funny or boring, we don’t care, just like we don’t care who dips what in chai and coffee. A video of Khan saab is doing the rounds on social media since yesterday. 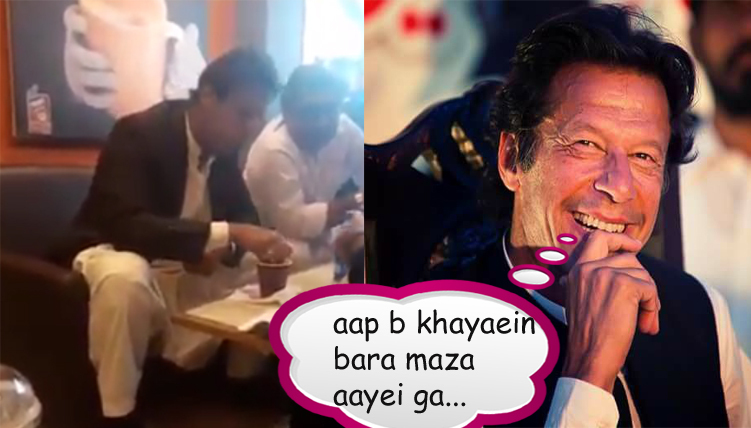 The video although a little blurry shows IK eating something with tea. The person who shared the video claims Imran Khan was seen dipping pizza in his tea/chai. Since he is a celebrity, his pizza and chai combination has become talk of the town. If someone knew my dad used to eat banana in a burger that would have made news too. SIGH. Alas baray logon ki bari baatain. All in good humour people commented on this video the entire day. While some people were shocked at this bizarre combination, others said their respect level has increased for their leader who reflects simplicity. Some joked that this was the last straw, IK’s lethal food combination has disappointed them. Watch the earth shattering video down below even if you have already seen it! Disclaimer: This post was written in good humour. If it offended anyone or the jokes didn’t get past your brains, you better try dipping pizza in tea.